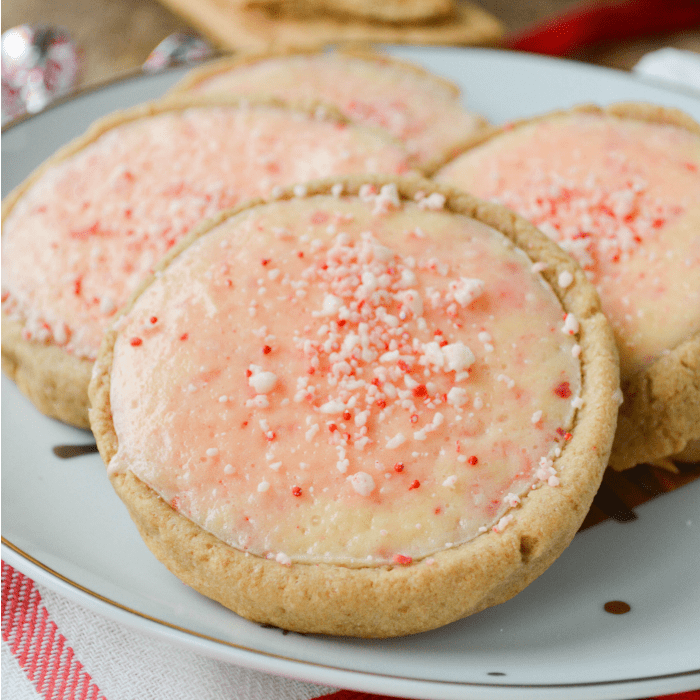 Peppermint Cheesecake Cookies will be the stars of your next cookie exchange. 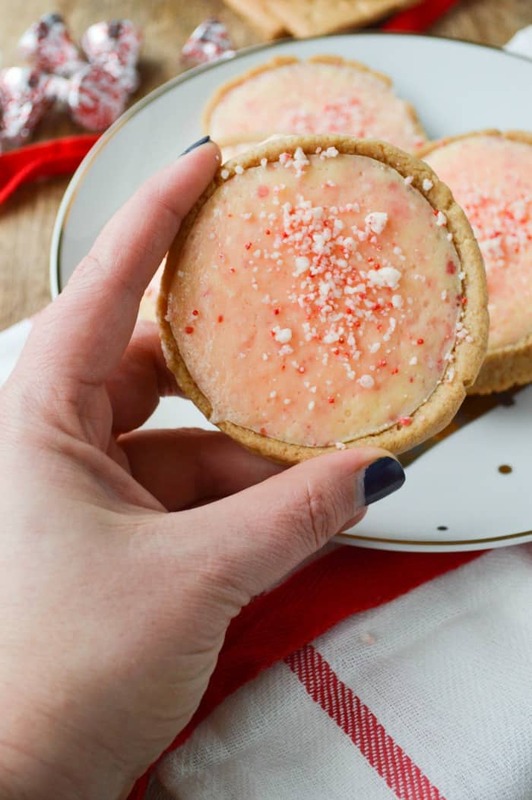 They are super simple to make, bake up quickly, and each cookie is like a tiny little peppermint cheesecake! UPDATE December 2017: I love cheesecake and I L.O.V.E. 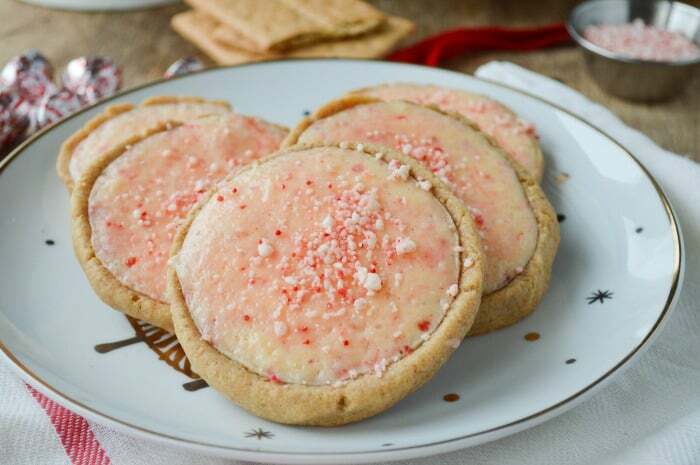 these peppermint cheesecake cookies! But they were stashed away in my 2013 archives with some sad terrible photos and needed some new life. 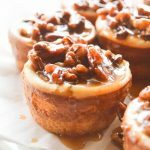 I didn’t change the recipe a bit, just added a few notes and tips that I picked up after making these for the last 4 years. And of course I gave you some new photos. Cause these are 100% worth sharing. Clearly I am a tiny bit obsessed with peppermint. I can’t help it. I LOVVVEEEEE minty stuff all year round – ice cream, brownies, milkshakes – but at Christmas that little bit of red and white plus crunch makes me so super extra happy! Every year I put peppermint cheesecake on my to-do list and every year it doesn’t get made because Christmastime is crazy busy and I don’t have hours to babysit a cake. I made cheesecake cookies!!!! And I have to say, these are a fan-freaking-tastic cheesecake substitute. They have a buttery graham cracker crust — just like cheesecake! They are full of a rich, delicious cream cheese filling — definitely just like the real deal. 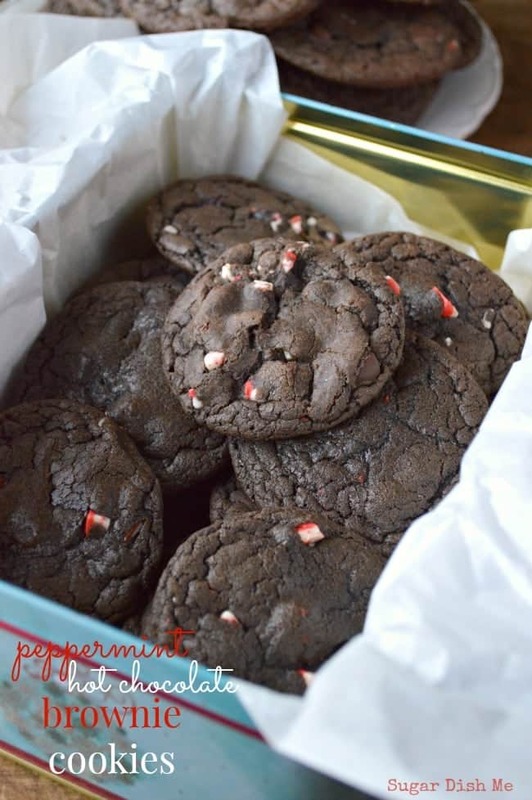 I also added chopped Andes Peppermint Crunch Mints — I cannot get enough of those this season — but you could also use the baking chips to achieve the same effect. It’s all delicious. 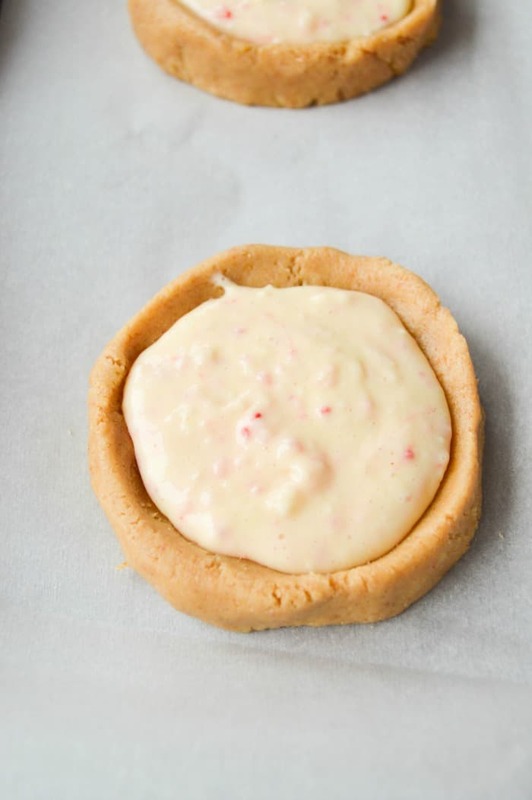 To make cheesecake cookies you have to start with a crust. This crust is made with graham cracker crumbs AND flour (and butter and egg whites and brown sugar) to give you that graham flavor that holds its shape but still has a nice cookie texture. You’re going to shape it into a ball. Then press your thumb into the center and start to gently pinch around the edges (like you are shaping a little bowl. It goes pretty quickly after the first one or two. 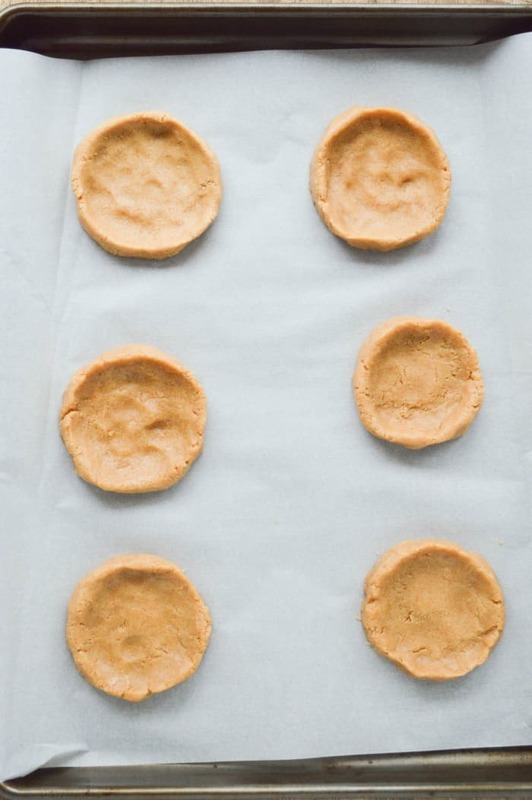 Place your little crust bowls that you made on your prepared baking sheet and then gently flatten the center of each so it resembles a tiny crust. Fill the crusts! How cute are these?! They bake up quick! 10-12 minutes is it. 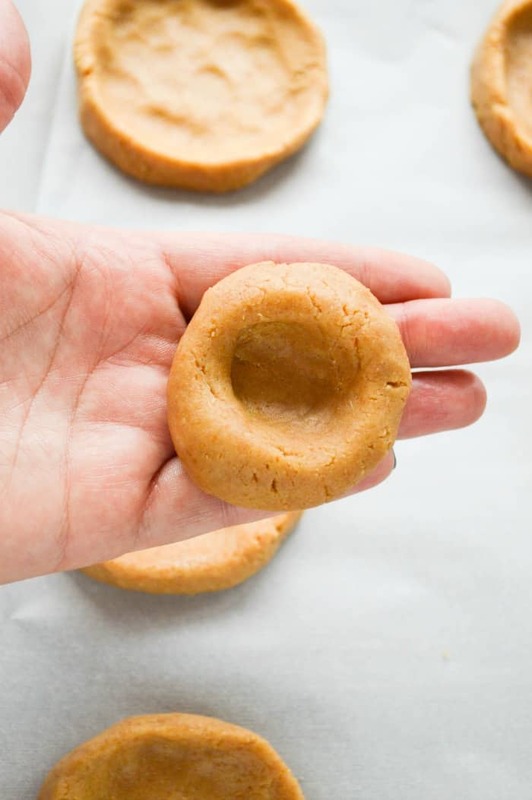 The center of each cookie will sort of puff up when they are ready. 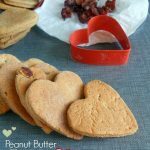 So IF YOU ARE GOING TO TAKE THESE TO A COOKIE EXCHANGE (or really anywhere to share) you’ll wanna make them a day ahead. 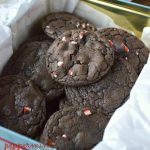 They are 100% awesome after they have chilled and I feel like the peppermint flavor amplifies overnight. I had been told by the cookie monsters that these are the most amazing cookies in the whole world, which says a lot since they taste test every cookie. Serious cookie palates over here. If you have a cheesecake lover in your life, these are perfect. A food processor will make these cookies a breeze. It really helps the crust come together in a texture that is easy to work with. You can make big cookies or small. I’ve found that what works best for me is to use 1- 1 1/2 tablespoons of the crust mixture to form the base. No time to bake a cheesecake? 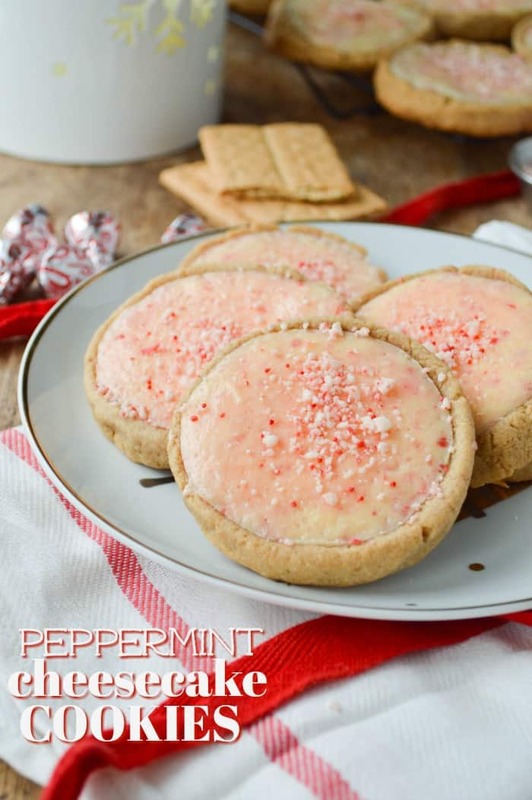 Make these delicious Peppermint Cheesecake Cookies! 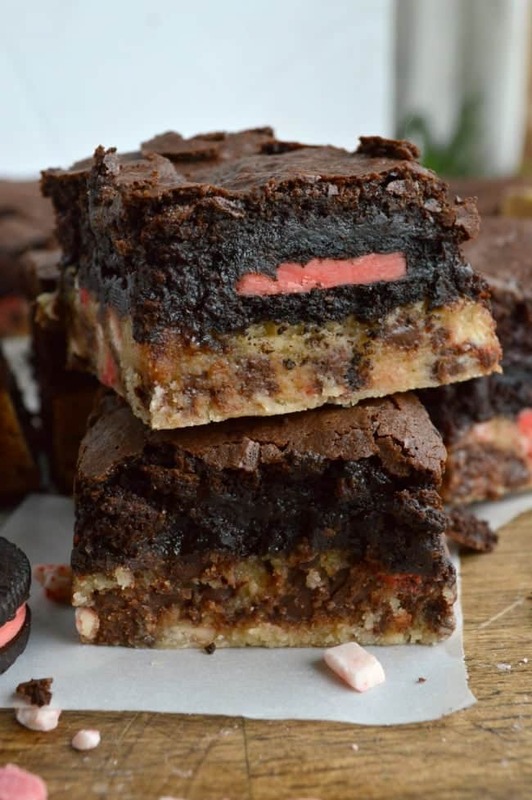 Graham Cracker Cookie Crust, creamy cheesecake filling and peppermint candy crunch! All the taste of traditional cheesecake in less than an hour! In a large bowl combine the graham cracker crumbs, flour, and brown sugar. Scoop 1½ - 2 tablespoons of the crumbles into the palm of your hand. Squish them into a ball. The crumbs will stick together after you work with them for a second. 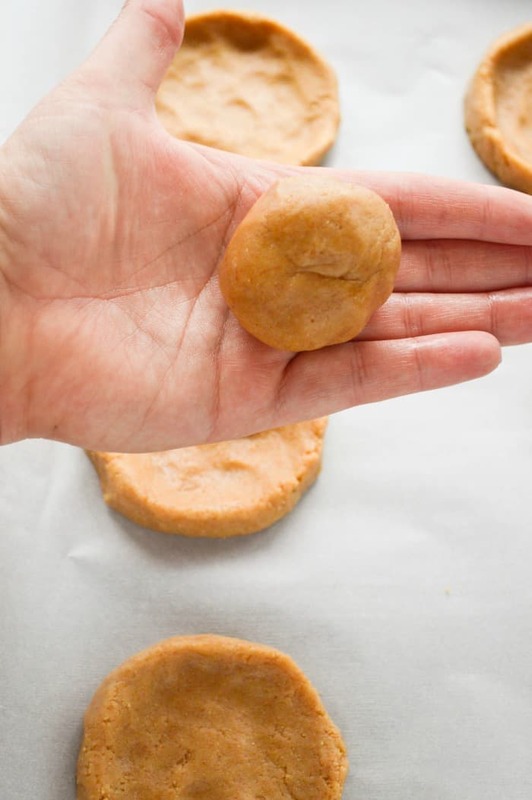 Place the balls of graham cookie crust on an ungreased cookie sheet an couple of inches apart. Press your thumb down in the center (like when you make thumbprint cookies) to make a little well. 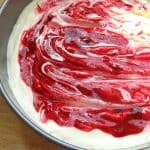 Flatten the center and pinch your fingers around the edges to make what look like little cheesecake crusts. After the first one or two this will go really quickly. In a large bowl, beat the cream cheese and sugar until smooth, for about a minute or two. Add the peppermint extract and the two yolks. Continue beating for about a minute. Fold in the chopped peppermint pieces. Spoon the mixture into the little cookie crusts. You can fill them all the way up. Let the cookies cool for about 5 minutes on the pan before moving to a rack to cool completely. Crust comes together easiest with a food processor! But I made these for years with just a hand mixer. It will also work! The mixture is a bit more crumbly with a hand mixer. Now you can have your cake and eat it too! Sorry, could resist! Fabulous cookies Heather! Yeah, every year I dream up super fancy desserts to make for Christmas, but when it comes down to it, I’m lucky if I have any cookies made! I LOVE LOVE LOVE those Andes baking chips!! These cookies sound dreamy. Hey Aimee! Thanks! I seriously bought ALLLL the Andes Baking Chips at Aldi. We’ll be eating peppermint in June. Ha! Arm twisted. 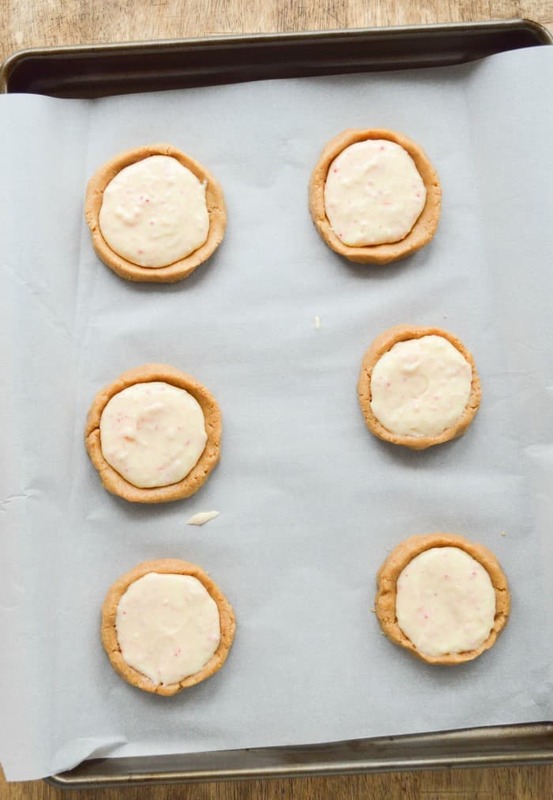 Cheesecake cookies for you! These are awesome!!! I’m pinning these babies!! Whoops! I edited this to exclude the baking powder. I am changing that part of the instructions now. 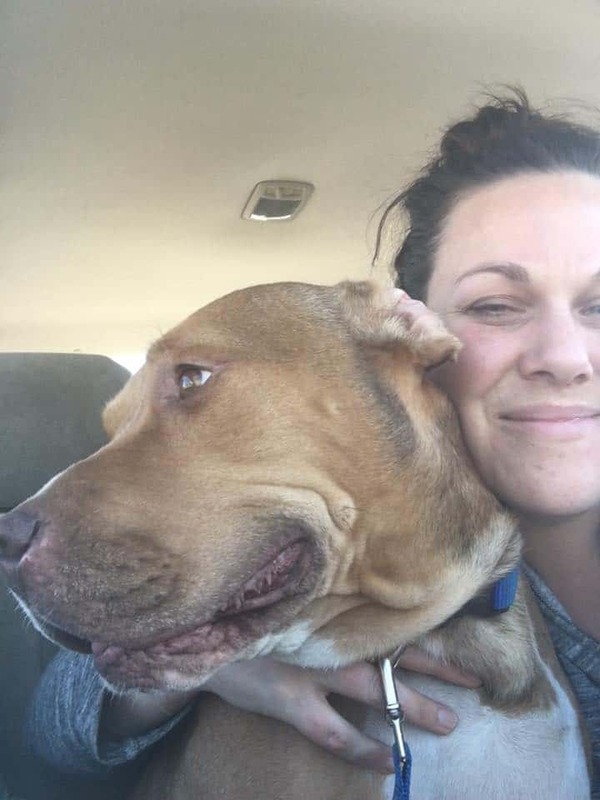 Thank you, Sarah!